Being part of the student body at Mirfield means being part of a very special community, where there are opportunities for socialising, relaxing and discussion. The Common Room is a sort of students’ union – an organisation which helps to ensure that students are fully involved in college life, have their say, get opportunities to socialise, and more. The Common Room provides a focus for student life, and meets at least once in each term to discuss elements of common life. It organises social events within the college as well as regular outings. There are regular opportunities for whole-college reflection (involving both tutorial staff and students).The Common Room also subscribes to a number of newspapers and magazines for students to peruse. This is an important role in college life: the senior student takes responsibility for a number of matters in the daily running of the college and chairs the meetings of the Common Room. This considers matters of a practical nature such as food, accommodation, etc. It meets once a term and is chaired by the senior student. This facilitates cooperation between the college and the college of St Hild, meeting to discuss matters of common concern. 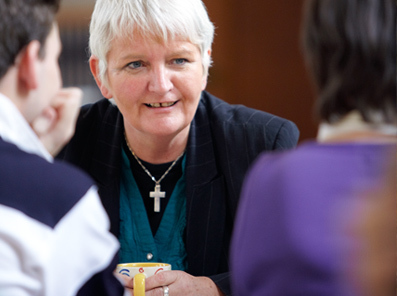 The College Council governs the college, and is chaired by the Right Reverend David Walker Bishop of Manchester. The council meets three times a year, with a number of sub-committees reporting in to it. The senior student and one other elected student sit as members. At the discretion of the Principal, 2 ordinands are appointed as sacristans each year. They work closely with the dean of chapel and the whole college community in serving the liturgical life of the college.